What is it to be an HONORABLE Leader? What is it to be an honorable leader as a woman in a foreign land? The last two weeks have been some of the most challenging moments of my life. These weeks have tested my character as a leader and a human, but especially as a woman. Circumstances here have brought me to tears and to my knees with this whole process. It has been more challenging than I could ever have imagined. I feel like my insides were scraped out of me and my heart was broken with the events that have transpired this trip to The OneMama Clinic in Uganda supported by OneMama.org. The questions inside me as to how do I act as a leader for myself and for the communities I represent both here and in the United States. How do I move forward not as a reactive, emotional, and impulsive being, scared by my own wounds. When I first gained news of things that were happening around me and in the communities I trust, I could not help but start crying and feeling lost. How could I have not seen or heard of any of this until now, especially when it seems to have been happening for a long time? It was 4:00 a.m. in Kampala when I uncovered—on social media of all places—a OneMama Director discussing ongoing accusations of domestic violence against him. I felt my whole world that I thought I knew, imploding in and around me…and at an hour when I could not get in touch with anyone. My first reactions were to retreat and make knee-jerk emotional reactions. I DID NOT DO THIS. Instead I allowed myself to do the following. I sobbed…and prayed…and sobbed…and prayed…and then wrote to all my thoughts and feelings. Then, I contacted my legal and spiritual advisors in the United States to seek counsel as to the plan I had put in place. The next morning when I could reach everyone, I began the lengthy process of meeting with those involved in the incident to gather the facts, both from our team and other parties. There were so many versions of the truth, all with even stronger emotions. I will remind you that I am the only person involved on-the-ground in Uganda who is not Ugandan. At times my cultural and linguistic understanding of things is not what it needs to be to handle something of this caliber. I had to stay firm in my role as a leader and not be a friend to everyone involved. This was to get the facts, then take action to ensure that all people OneMama.org serves were out of harms way. I would not know when I started this investigation that it was like a loose string on an old sweater. With a light pull, it unravels an issue that is much bigger than a few people—even bigger than the OneMama Clinic and community. This is a global issue that I know all too well from my work with OneMama.org, and the work with UN Woman. However, it is different to hear about something and experience the gritty reality firsthand. When you are in the trenches and see people almost dying in front of you, statistics take on a new meaning. 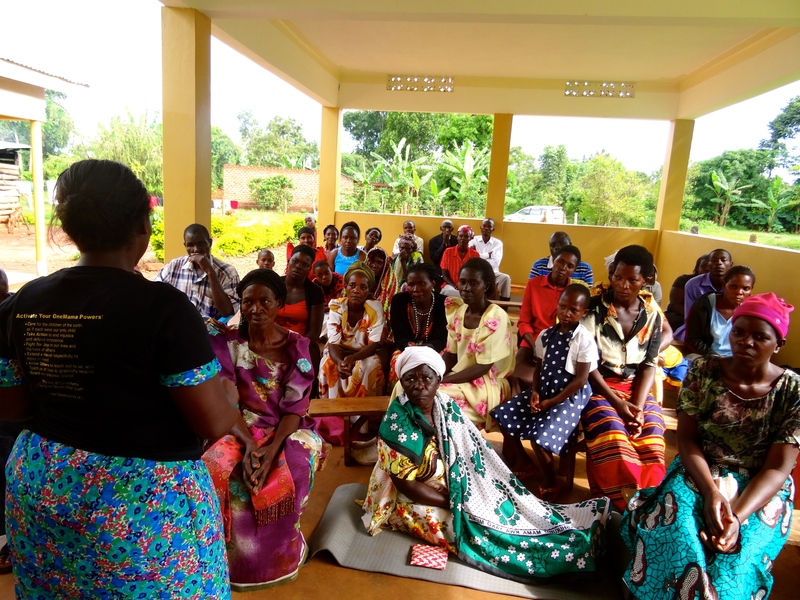 I must admit, I knew things could be bad here for women, but I had NO idea that how bad—not only in Uganda, but also for women all over the world. I feel like my vision has been enhanced, and I can now see things that I none of us should ever have to see. I read on Facebook that a local OneMama Director, sharing by his own admission on Facebook, had been to jail for domestic violence against his wife. He claimed he was not guilty in the post, but then confessed in person a few days later. Within 48 hours I had spoken to the victim, his wife, and every member involved in these allegations. I also spoke with authorities, specialists in the field, our staff, and community members to get their version of the story as well as an understanding of how this could have been happening without me ever knowing it was taking place. We had an emergency meeting with all team members, including the person accused and the victim of this abuse. In this meeting it was confirmed by the offender that the allegations were true and the victim then got to tell her truth. Immediately following this meeting, we began getting things in place for her protection and safety moving forward. We have now involved two Domestic Violence NGOs to train all staff, team members, and partners. We have already begun trainings with domestic violence NGOs for all community members to shift beliefs on household violence at a community level. Something that soul shaking occurred within hours of this meeting. An unconscious woman was brought by her husband to our clinic. He stated that she hit the back of her head during a fall, and had been unconscious for hours. We immediately arranged for an ambulance to come and take her to Kampala, a four-hour drive away. I knew something was wrong with this… so I asked if the woman fell or if she was hit. From the injuries, it could not be confirmed as abuse, but indications of past abuse were present. It was revealed this woman had been treated before for injuries that appear to be domestic violence related. When I asked those around her for confirmation, they looked away. It was revealed later that in the community there were rumors of beatings and ongoing abuse. Now, she was possibly about to loose her life from an alleged beating. If an ambulance had not been found—they are very rare in this region of rural Uganda—she may not have lived. The disturbing part of all is that because domestic violence is so commonplace in Ugandan society, the husband has still not been charged or even investigated, and the community remains silent on the matter. The silence of the community is another kind of beating in my opinion. Many women find this so common place they think it is another form of love in many cases. It is not perceived as abuse, but merely relationship issues. This made me realize that steps must be taken to educate both men and woman about violence. We cannot blame men and expect this to stop. We cannot blame women and expect this to stop. We have to all step up and find a way to educate our communities about violence against all beings, women, men, and children. Watching this woman at death’s door in front of me, and because of the man she loves almost killing her with his bare hands… It stops you in your tracks. I had met this man before in the village and our interactions have always been cordial. He speaks on women’s advocacy for the village and yet in his own home separates these incidents out as “relationship issues,” as do most people here. Honestly, around the world this is how it is done. We have made many shifts in last 50 to 60 years for women in many cultures, but even still in the United States, a woman is assaulted or beaten every nine seconds. Statistics across the world are astonishing. We cannot continue the way we have been doing it for thousands of years. We have to find a way to not label those who commit violence as bad, but rather ask, how can we rehabilitate these old patterns passed down from one generation after another? How can we shift thinking of both men and women to behave differently? I am going to institute this here at the OneMama Clinic as best I can. I realize that is not popular here since it is a HUGE shift in thinking. This could even be dangerous for me personally as I try to implement solutions, but I cannot stand by and do nothing. I am a woman with a position of power in communities and I must do something. If not, then I am just as neglectful as someone who acts violently against another in choosing to perpetuate this problem. It may work or it may not work, but I am going to do everything I can to at least do SOMETHING! If I had to do it again, building this OneMama clinic, I would do it differently. For every step forward it has seemed we’ve taken two steps back. From day one, we have stayed the course trying to learn and make things move in the right direction. Trying to follow what seemed like the highest and the best in that moment. Honestly, I am not sure if you ever get a viewpoint that is clear in starting something like this kind of social change. These women, children, and communities face the most devastating things daily. I think about where these women and children have come from and what they face on a daily basis. You’ll find them carrying buckets of water on their heads after walking three or four kilometers a day, fighting off physical and sexual violence daily, family all around dying of AIDS or other life threating issues, the pure violence of poverty in general… and the lack of healthcare, resources, or even food on the table. Almost every person, especially women in our community here, have already endured what would take most people out of the game of life. Yet they keep moving forward with what still seems like JOY in their hearts. This is why I fell in love with this community. It’s the endurance of heart and joy in what seems to be unthinkable situations. Uganda has the highest incidence of domestic violence in the world. Domestic Violence victims are out there silent. The 2013 Uganda Bureau of Statistics, reported that close to 70% of “ever-married” women aged 15 to 49 had experienced some form of violence” at the hands of their partner. World Health Organization (WHO) states that globally, about 38% of murders of women are committed by an intimate partner. In 2011, the National Crime Records Bureau reported 8,618 dowry deaths in India, but unofficial figures currently estimate that there are at least three times more dowry deaths that previously thought. The new Vision of June 18, 2013 reported that there was 2,461 victims and 1,339 cases of domestic violence reported by April 2013 in Uganda.